Title is Thoughts n Reflection where you write one liner each day based on the question given (diff questions each day) and it has space out the book so that you can write in it for 3 years. Tadi i went to subang parade to wash and wax my car. While waiting, stumbled upon the MBO counter opened near the information counter. I decided to sign up as a member since it’s free! (The word FREE did it for me :p). Also when u signed up, u will get free large popcorn but today is the last day. Since i signed up for 2 person, i got 2 free large popcorn. While queing nak amik popcorn (tak tgk wayang pun..mkn popcorn je) i was thinking nak redeem one only..lagi satu burn la kot..sbb if i redeem 2 large popcorn it will be wasted only. Tapi tgk ada these 2 school girls ke uni girls tgh beratur in front of me..so i offered to give them the other large popcorn..muka diorang cam takut2 je..agak ingat pompuan gila mana ke nak bomoh ke..tapi lepas explaining to them that i have extra popcorn voucher..baru diorang macam happy nak accept. Lepas dapat popcorn siap salam salam wa lagi.. So for those who always spend their time at mall that has MBO..feel free to sign up. You may not get the large popcorn voucher anymore but it’s free and u get to enjoy many benefits and priveleges. I’ve been searching for the right jeans for quite some time now. Searching for boot cut jeans to be specific. Asyik jumpa skinny jeans je bila jalan jalan usha jeans. Total of discount i got was rm160 which is way higher than the amount i paid for my membership :p yey! Rabu lepas went to Loccitane in bv2 for member’s day and to collect (and also spend) my voucher. I got rm225 voucher to spend..so what else..i got myself the almond range.. 😉 got 2 bottles of jumbo almond oil..the smoothing lotion..almond everyday scrub and one almond hand lotion. After spending more than 500, you get free miniature set and also a shiny loccitane thermos. Being the early bird, they also gave me this chic loccitane umbrella! So smalam lepas kemas kemas my wardrobe..i was feeling a bit depressed since i gave away almost half of my clothes..So what’s a girl to do? I went shopping!!! 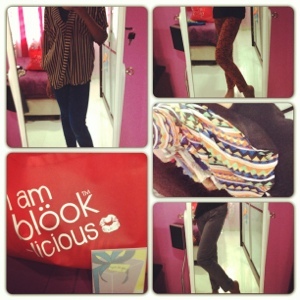 I went to subang parade this morning..went to my favorite clothes store Blook to see if there are anything worth buying.. In the end..i bought 2 tops and 4 pants :p total was rm318..but the girl said if the total is above 500..i can get the vip membership where i can get all items 10% off and 20% off on my bday month 🙂 so i bought rm150 voucher that can be used within the next 3 months and entitled to the vip membership discount! Yey! Have you ever wanted a custom made shoes where you can choose your own material, design, heel height, colors and size? I stumbled across Distro KL while browsing my following’s instragram. The shoes looks great and the all of the customers said that it is comfortable. So when they open the period to order..I ordered Leonar Design shoes (wedges) . I choose the design to be closed, with ankle strap, wedges with 3 inch heels in red suede. My shoe cost RM190. Ouh..fyi, Distro KL shoes price ranges around RM180 – RM250 ish depending on the shoe type. Sambil jalan jalan cari idea…ternampak this one shop.. Muse..gaya macam ala ala Sasa..so I went in just to browse .. tetiba terpk..beli perfume lah kat mama..
After sniffing around, I decided to buy D&G rose for mama..beli yg 50ml..ada 5% off (certain stuff is 10% off). Lepas tu…usha usha keliling..dia kata with the purchase, I’m eligible for 30% off for mask. Apa lagi..borong pulak mask..bought 2 intensive hydrating mask and 2 intensive repairing mask. Then I also bought eye serum (kebetulan eye cream saya dah abis) from Skin Med. With the stuff I bought, I got RM60 voucher. The expiry date is 2nd August. So I decided to just redeemed it there. Bought 3 lip balm from Burt’s Bees. 3 perisa..satu peppermint, satu berry and another one is mango..
Setelah happy dapat barang2 ni semua..Muse also gave me 2 session of hand massage. Come visit Muse in Pyramid if you are around that area. For spending over rm350, i also got this gift .. I went to Loccitane…again! 😛 dOn’t blame me..It’s their fault..they sent me this sms saying that in BV2 (i registered my membership there) is reopening after doing a one month renovation. There is gifts for early bird, promotion, vouchers. So naturally..me being me..went there to see if there’s any good deal. The promo is good since i am saving rm60 for each set. So overall i managed to get rm120 off and i got the gift set as well!! How great is that? ?